Few volcanoes are as spectacular as Mount Nyiragongo. Known for its active lava lake and (relatively) frequent eruptions, this incredible volcano has the potential for widespread disaster. 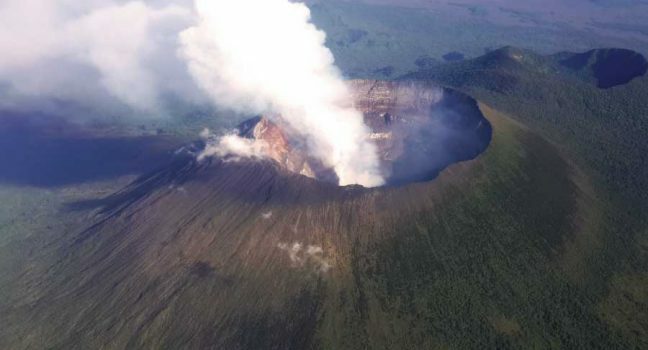 Nyiragongo Volcanic mountain is located in the Western part of Virunga National Park and is ranked to be among the most active volcanoes and is open to tourists that wish to visit for Hiking Adventure. Pick up at the border or at your hotel/Airport then drive to volcano hiking point in Kibati Mount Nyiragongo is an active stratovolcano with an elevation of 3470 m (11382 ft) in the Virunga Mountains associated with the Albertine Rift. It is located inside Virunga National Park, in the Democratic Republic of the Congo, about 20 km (12 mi) north of the town of Goma and Lake Kivu and just west of the border with Rwanda. The main crater is about two kilometres wide and usually contains a lava lake. The crater presently has two distinct cooled lava benches within the crater walls – one at about 3,175 metres (10,417 ft) and a lower one at about 2,975 m (9,760 ft). Nyiragongo’s lava lake has at times been the most voluminous known lava lake in recent history. The depth of the lava lake varies considerably. A maximum elevation of the lava lake was recorded at about 3,250 m (10,660 ft) prior to the January 1977 eruption – a lake depth of about 600 m (2,000 ft). A recent very low elevation of the lava lake was recorded at about 2,700 m (8,900 ft). Nyiragongo and nearby Nyamuragira are together responsible for 40% of Africa’s historical volcanic eruptions. Morning after your breakfast at the crater rim, you will be overlooking the city of Goma as well as the 2 other older crater lakes. The volcano partly overlaps with two older volcanoes, Baratu and Shaheru, and is also surrounded by hundreds of small volcanic cinder cones from flank eruptions. After Break Fast you will Drive to Kigali and Take City tour Exploring Kigali Visit some Craft Markets for your Souvenirs Before Transfer to the Airport. NOTE: Safari prices will be availed to you on request. Fill our booking form for your price quotation. Nyiragongo volcanoes can be visited all year round but keep in mind there is unpredictable weather changes such as regular rains during certain months of the year because Nyiragongo is in the middle of equatorial rain forests. Like from March to May and as well as November tends to be a rainy season. The dry season begins in June to October and also December. So during the dry seasons the forest are always clear giving you a chance to enjoy and take photographs of the stunning landscape views of the greater Virunga mountains national park. Nyiragongo Hike & Gorilla trekking in Congo is a year-round activity but Nyiragongo hike will be appreciative during the drier and cooler months of January and February and again from June to September.